Of the scores of kinds of seaweeds consumed around the world, nori is the overwhelming favorite. 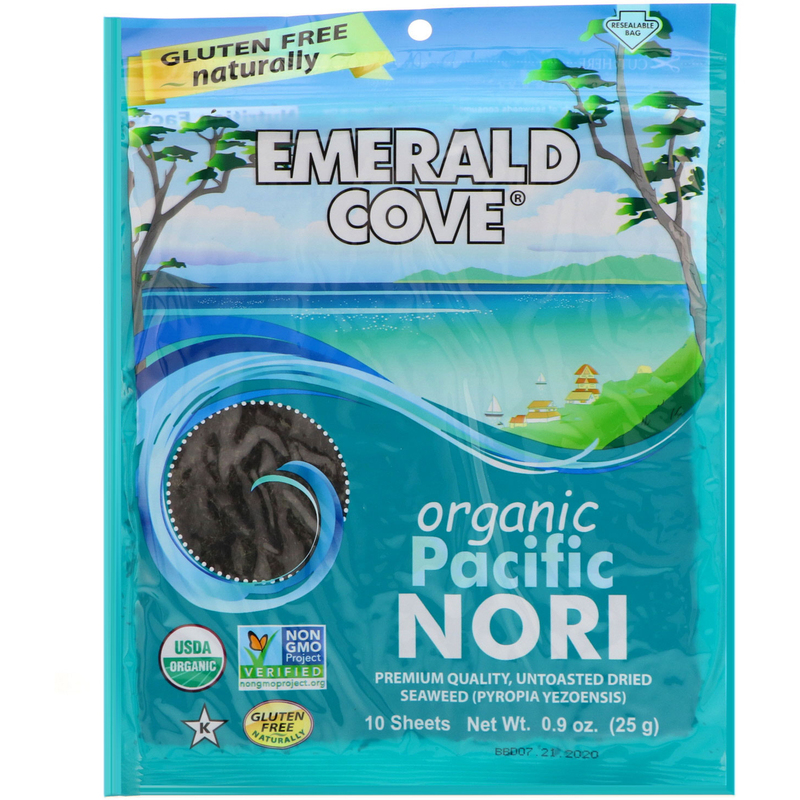 Although originally gathered wild, nori has been cultivated in Japan since the 1700's, and today more than 300,000 tons of fresh nori are harvested annually from farms in coastal Japan, Korea, and North China. Nets of woven rope are suspended below the surface of the ocean in quiet bays, and, during the cold months of winter, the nori slowly grows to cover the entire net. From December to February, the nori is hand-harvested, washed, and placed in frames to dry into paper-like sheets. This low temperature, slow drying is essential to retain the nutrients. Emerald Cove Organic Pacific Nori has a fine, pliable texture, producing exceptionally smooth and delicious rolls of nori-maki sushi. Just briefly pass over a low flame to toast before using. You'll marvel at the clean, sweet taste of this kind of edible sea vegetables. Place all ingredients, except nori and garnish, in a bowl and mix together well. 1. Briefly pass each sheet of nori over a gas flame or electric burner until it turns bright green. Nori is delicate and burns easily, so be careful. 2. Cut each nori sheet into four quarters. Carefully fold one piece of nori at a time into a cone shape. A drop of water will stick overlapping sides together. 3. Fill each cone with mix, garnishing with a sprig of parsley. 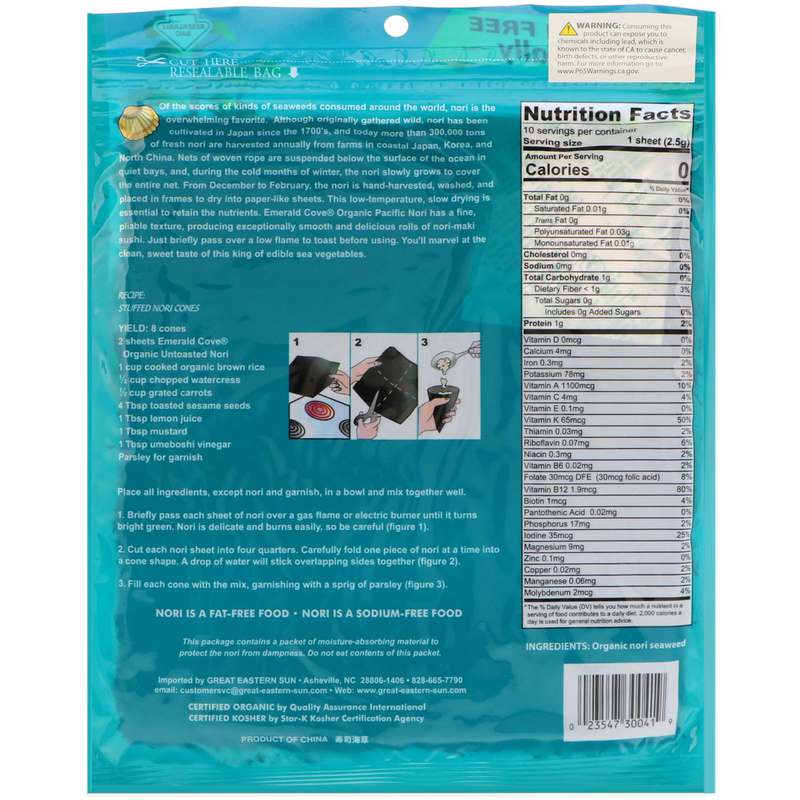 This package contains a packet of moisture-absorbing material to protect the nori from dampness. Do not eat contents of this packet. Consuming this product can expose you to chemicals including lead, which is known to the State of CA to cause cancer, birth defects, or other reproductive harm.